The YouTube generation simply isn’t watching TV the way their parents are, or so says the latest Digital Democracy Survey of American media habits. The study, conducted by consulting firm Deloitte and published by Recode (PDF), asked over 2,000 Americans about their media consumption and technology use. Specifically, participants were asked to explain how they divide their time watching movies and TV shows over the different devices they own. According to the survey, the average American consumes 71% of his or her media on television, with just 16% of us trying to catch episodes on our PCs. Even fewer are using smartphones (4%), gaming systems (4%) and tablets (5%). But as you might expect, that’s hardly the story here – how we consume media varies dramatically between generations. When it comes to younger Millennials aged 14 to 24, the bulk of entertainment time is spent on laptops, smartphones, tablets and Internet-connected video gaming systems. Only 44% of their TV watching time happens on a television. Millennials aged 25 to 30 spend 53% of their media consuming time watching TV, while Generation Xers (31-47) are in front of a television 70% of the time. Technology has made little dent in the habits of older Americans, many of whom prefer the familiar TV over newer tech items. Approximately 92% of senior citizens' time (age 67+) and 88% of Baby Boomers' time (age 48-66) watching TV is still done on an actual TV. This news, while likely not a shock to the U.S. cable industry, paints a picture of a tough road ahead for paid TV. 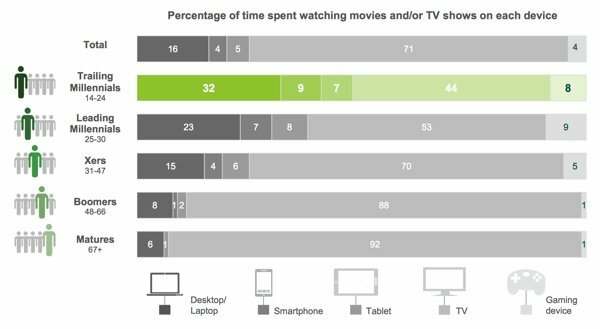 Americans in 2014 may be willing to pay for both cable TV and cable Internet, but that’s because most of us still use our TV out of habit. But as Millennials get older – and more importantly, are no longer having their media use paid for by mom and dad – cord cutting will become even more prevalent. After all, why pay for a TV and service that you don’t watch?